A new addition to the old distillery’s widening range of Single Malts. Designed to sit just below the standard 12 year old as an alternative entry level whisky, this dram offers extraordinary value for money. 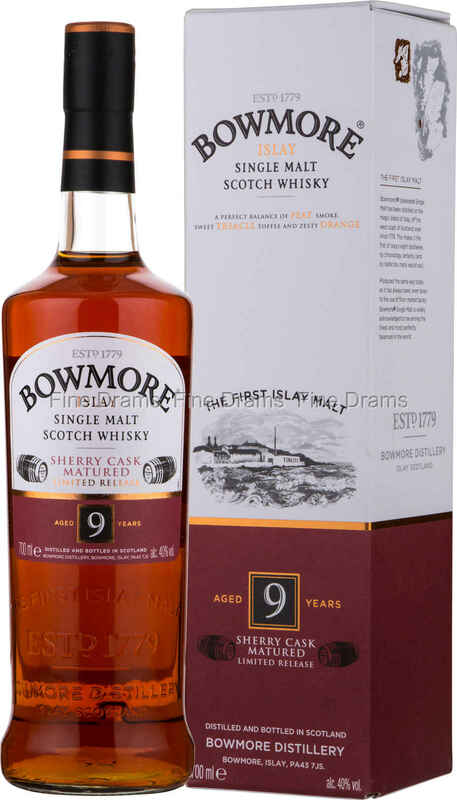 A whisky that is as rich as the colour suggests, it has been matured in a mixture of bourbon and sherry casks, creating a wonderfully chewy and fruity whisky to accompany the thick peat typical of Bowmore’s malts. The nose reveals juicy blackcurrant aromas alongside a peppery smoke and honyed sweetness. The palate stays true to the nose, but brings further flavours of peatsmoke, chocolate and espresso. On the finish the sherry cask takes hold, with a lingering fruity sweetness.